This uplifting, mysterious version of Flowerbomb caught my eye, while shopping at The Bay and I had to try it, only to fall in love with it so much - I purchased it without a second thought. 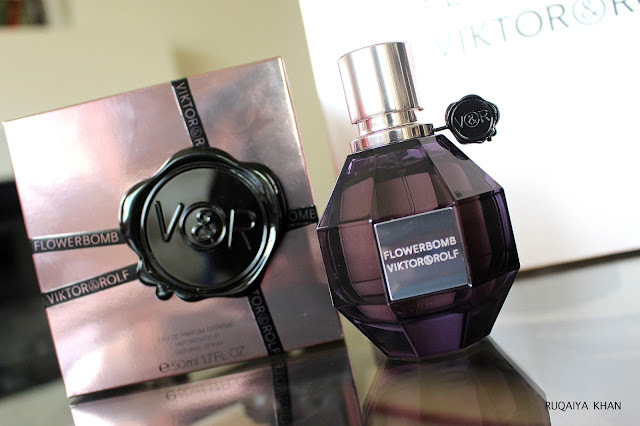 I never truly enjoyed Flowerbomb; it's a bit too sweet on me and I do not like how it dries down. But something about this one is so captivating, I can't get over it. Its definitely a heavier scent and maybe more appropriate for night time (I use it all the time though). Love the sophisticated vanilla at its base and the woody tones are just enough to keep it feminine, yet powerful and elegant. Who can not fall for this amethyst bottle that is shaped like a grenade? It symbolizes the floral explosion which is a treat for all senses. Even though Flowerbomb Extreme has been around for quite some time, I felt that it's new to Canada, since it was displayed as a new perfume. It also fits well with the 'Oud' perfume trend that has been going on and every designer perfume has a Oud version available. I never saw those anywhere except the Middle East, so the heavy scent trend is really catching up. The only thing that makes Flowerbomb Extreme better is that it does not leave a trail of perfume behind me, nor does it overpower the space I occupy, which makes everyone around me feel comfortable. Ouds are extremely strong btw. Flowerbomb Extreme is very similar to the original Flowerbomb and has the same top notes of Bergamot and middle notes of Sambac Jasmine, Freesia, Centifolia Rose and Osmanthus. The base notes however do not contain the sweetness of Praline notes and the powdery Amber which makes a huge difference on me. I like that it ends with a Benzoin that compliments the Vanilla and Woody notes. 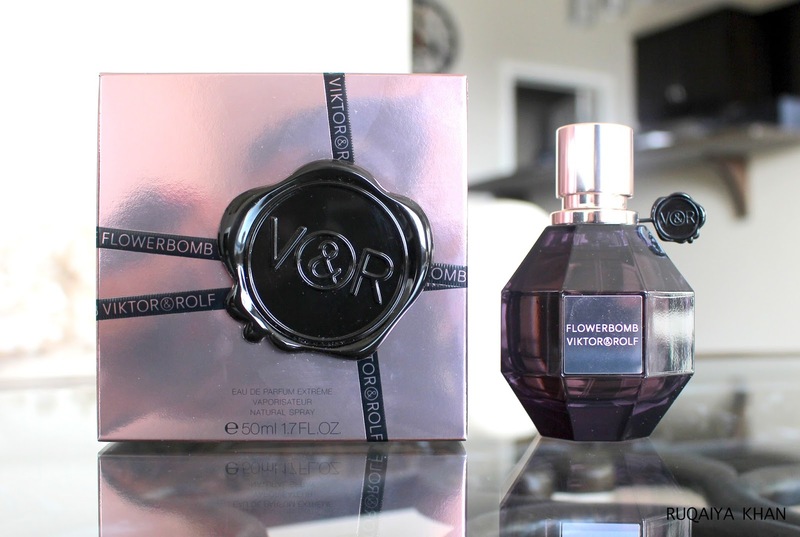 It's a really sophisticated and elegant version of Flowerbomb and it lasts pretty long on me. I can smell it off my clothes after days, so it's pretty long wearing on me. However, I can mostly smell vanilla and patchouli. I have one regret. It was only available in 50ml at The Bay; wish they'd sell bigger bottles one day. I checked it at Sephora too and they offered the same 50ml bottle, even though the original Flowerbomb comes in a 100ml bottle too. 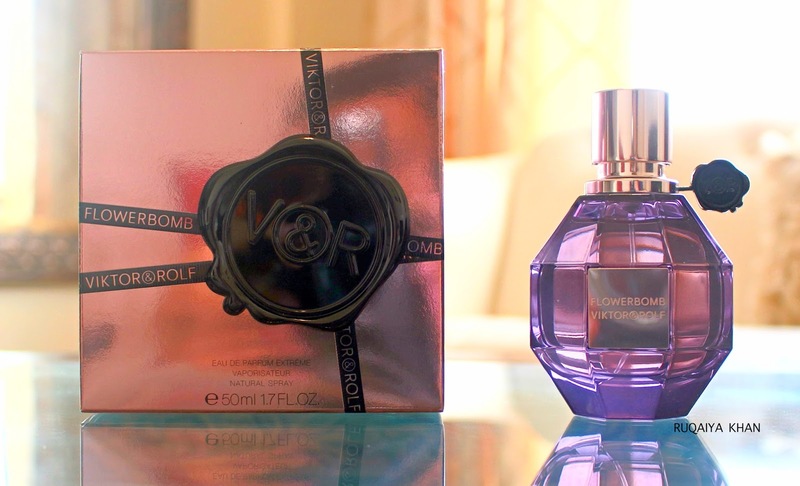 Viktor & Rolf Flowerbomb Extreme is what luxury smells like. It's a self indulgent, mysterious scent and love it for what it is and how it quickly uplifts my mood and makes me feel amazing. If you are looking for a new scent, do give this one a try or give it as a gift to someone you love.